This will be Michael Pineda’s final start of 2011. The hulking righty is comfortably among the top 10 pitchers in baseball in fastball velocity, K rate, and batting average against and he’s among the most valuable rookie pitchers in baseball. He’s been remarkable despite being so obviously raw. He still doesn’t throw his work-in-progress change-up all that much. He’ll miss spots significantly – throwing 4 consecutive fastballs out of the zone, or throw a slider in the middle of the plate. But, in general, he’s so talented that he’s not hurt in the way that other pitchers are. When your fastball is so good, hitters are more vulnerable to offspeed pitches – even the occasional *bad* offspeed pitch. 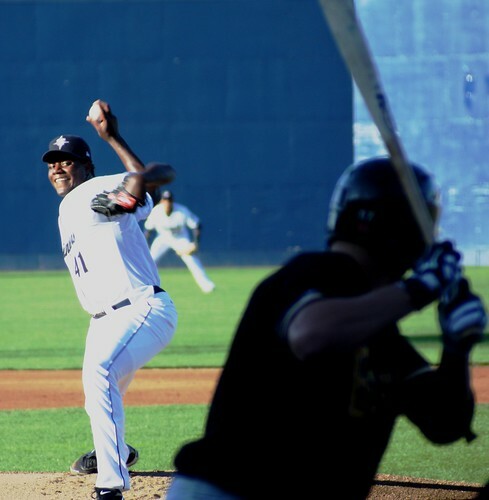 Michael Pineda has been an absolute joy to watch, and his development is a joy to dream about. You’re not supposed to be raw AND YET a good control pitcher. You’re not supposed to work on your offspeed stuff in the majors and get away with it. Get a win for him, M’s. Man, I love double-plays that involve the catcher. And 1-2-3 is pretty rare even among those. Whoo-hoo! it’s nice to play a team equally poor. I really hope Pineda works on his change in winter ball and/or spring training and gets it down, so we don’t have to hear people harping on it anymore. WTF Jimenez? You take the out at first. No tag needed. We were very lucky there (and Olivo deserves props). Pena as a pitch runner. If the M’s keep winning they’re going to blow their shot at another ACC player. Doesn’t look like we’ll be getting the #2 pick. I wish that Pineda had got the win. He’s been great for us and deserved to win 10 or more.